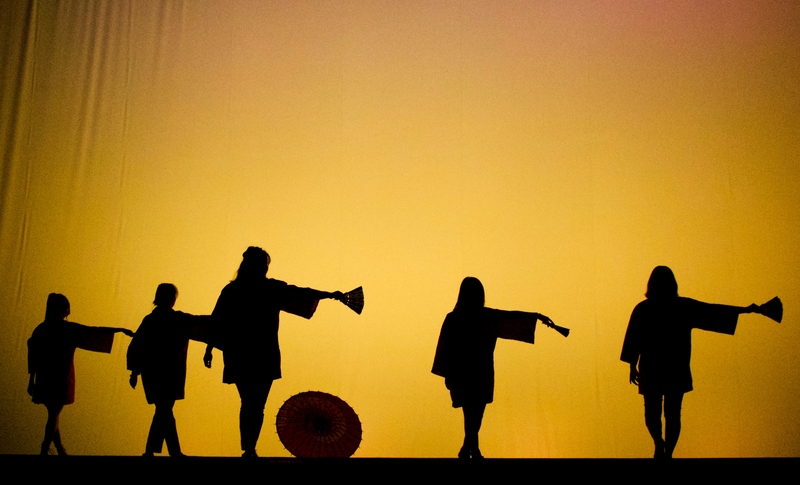 Above: One of the Waseda dances was performed by students using fans and umbrellas. Below: Students performed a Chinese martial arts dance. The Lawrence International (LI) annual Cabaret performance “An Odyssey of Cultures” was held in the Stansbury Theater last weekend. The two showings were held on Saturday, Apr. 6 at 6:30 p.m. and Sunday, Apr. 7 at 3 p.m. Cabaret 2019 featured a celebration of dances, songs, arts and cultures from all over the world in two acts. The theme of Cabaret 2019 was “An Odyssey of Cultures.” Inviting members of the audience to discover something new, LI intended to “embark on a short voyage on our ocean of uniqueness, and to remind ourselves of the coexistence of our differences.” LI hoped that everyone would have unearthed new destinations on their own maps of the world after the Cabaret. Yidi Zhang, the President of LI, acknowledged the 2018-2019 LI Executive Board. Then, the mic was handed off to three emcees: seniors Robert Meiser, Rufino Cacho and Thao Nguyen. After they heated up the stage with a song, the show officially started. The first performance was “Chande Re,” which means “Moon Song.” It is a beautiful lullaby from the Indian state of Rajasthan of a woman attempting to coax the moon to smile. A solo dancer told the story of the lyrics through an Indian classical dance with accompaniment. Tien Tran and Linh Le then sang a song from a music genre popular among young Vietnamese people. The song was titled “Vo Tinh,” which means “ruthless” or “by accident.” This song was combined with EDM and Vietnamese folk song melody. Representing modern German culture, “Berlin Berlin” was performed next. After that, Ramisha Mahiyat dedicated a Bengali traditional song to cherish the golden moments in our life. The first act ended with a K-pop dance, which focused on the third generation of Korean pop dance culture. Fashion shows were included in both acts. Student representatives from Chile, China, Ecuador, Indonesia, Japan, Ethiopia, Korea, Nepal, Pakistan, Vietnam and Sierra Leone wore traditional outfits to show their cultures. All participants were allowed to perform in acts that were from a culture outside of their own. Students with or without international backgrounds were welcomed to perform on the stage. Cabaret has become an event synonymous with the exchange of cultures, traditions and values. It is also an event that works at making Lawrence a more diverse and inclusive campus.